Koert van Mensvoort tells about his nano-supermarket project, as a way to stir societal discussion. Dr. Koert van Mensvoort (NL) is an artist and philosopher best known for his work on the philosophical concept of Next Nature, which revolves around the idea that our technological environment has become so complex, omnipresent and autonomous that it is best perceived as a nature of its own. He uses all media to materialize his philosophy. It is his aim to better understand our co-evolutionary relationship with technology and help set out a track towards a future that is rewarding for both humankind and the planet at large. 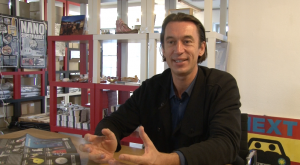 He received a MSc in computer sciences from Eindhoven University of Technology (1997) a MFA from the Sandberg Institute, Masters of Rietveld Academy, Amsterdam (2000) and a PhD in industrial design from Eindhoven University of Technology (2009). Van Mensvoort is director of the Next Nature Network; an Amsterdam based think and design tank on the changing relation between people, nature and technology (2010-). Furthermore he heads the Next Nature Lab at the Industrial Design Department of the Eindhoven University of Technology (2003-).